Ubisoft has shared new details, video, and screenshots of For Honor, including information about the game’s limited edition, playable roster, multiplayer modes, and when the closed alpha test will run. 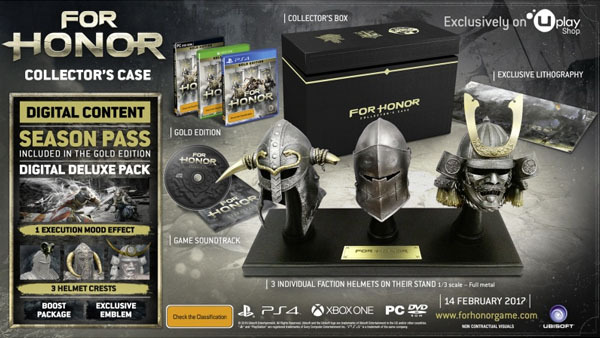 Consumers who pre-order For Honor will receive the “Legacy Battle Pack,” which includes three Hero outfits embodying the spirit of each faction. These three armor styles are exclusive to the Legacy Battle Pack and are wearable by the Warden, Raider, and Kensei Heroes. Hybrids mix elements and characteristics of other types. They are advanced characters fostering uncommon tactics. There is also a wide variety of customization options. At the end of each multiplayer match and campaign mission, players are awarded XP that unlocks new combat abilities and visual customization options. They also have the chance to loot armor and weapon parts on the battlefield, with specific stats allowing each player to adapt their gear to their play style while ensuring fairness and balance in multiplayer. Elimination: In this 4v4 mode, the last surviving player on the battlefield wins the round for their team. The closed alpha test for For Honor will run from September 15 to 18. For Honor is due out for PlayStation 4, Xbox One, and PC on February 14.